In recent years, political turmoil and popular revolt have engulfed Hong Kong in a broad struggle to preserve its foundational institutions and core values. While many observers and activists fear for the permanent loss of Hong Kong as a bastion of rule of law and liberal capitalism, others pin their hopes on the rise of new political assertiveness and proliferating aspirations for democracy among the younger generations. 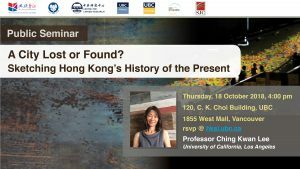 This talk explores the major analytical and historical themes that should inform a political sociology of Hong Kong in the post-1997 era. The project here is inspired by the notion “history of the present,” understood as a critical historical search not so much for the origins of the present crisis, but for traces of the past whose emergence, repurposing and articulation continue to shape how power operates today. Ching Kwan Lee is a professor of Sociology at UCLA. Her research interests focus on labor, political sociology, globalization, development, China, Hong Kong, global south, and comparative ethnography. She has published three award-winning monographs, forming a trilogy of Chinese capitalism through the lens of labor: Gender and the South China Miracle: Two Worlds of Factory Women (1998), Against the Law: Labor Protests in China’s Rustbelt and Sunbelt (2007), and The Specter of Global China: Politics, Labor and Foreign Investment in Africa (2017). Her articles have appeared in the American Journal of Sociology, American Sociological Review, Theory and Society, New Left Review, the China Quarterly, and Journal of Asian Studies. She is the co-editor of Take Back Our Future: An Eventful Political Sociology of Hong Kong’s Umbrella Movement, now under contract with Cornell University Press. 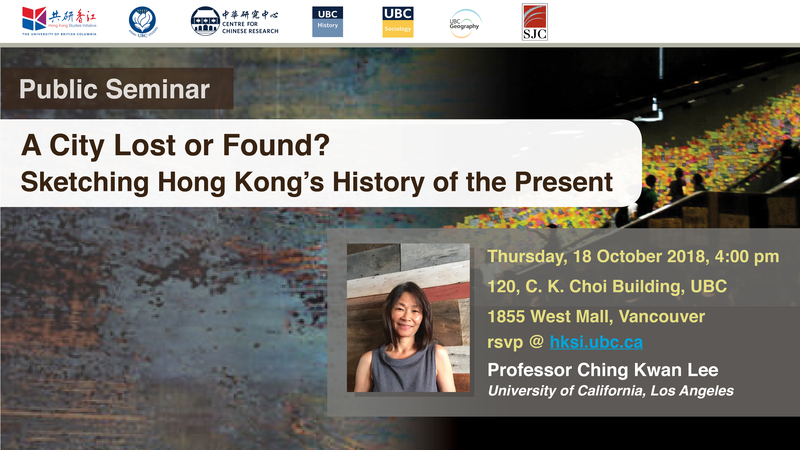 This public seminar is organized by the UBC Hong Kong Studies Initiative and co-sponsored by: Department of Asian Studies, Department of History, Department of Sociology, Department of Geography, Centre for Chinese Research, and St. John’s College.